Situated in the picturesque Usk valley, within the Brecon Beacons National Park. 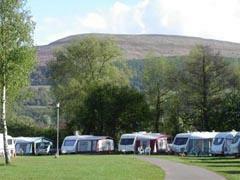 A small friendly site, ideally located for touring the Black Mountains. Fishing tickets available for River Usk. A wealth of golf clubs within easy driving distance. Pony-trekking nearby. Excellent walking area for all abilities. take the A40 Brecon road from Abergavenny. We are 2 miles west of the town, 50 metres past the telephone box. Bus stop only 50 metres from the entrance. Railway station only 3 miles away.